Highest Quality, Best Value, Guaranteed! Replaces oe number : 15650047. "Dorman Wheel Center Cap --. Series : Dorman OE Solutions. Quantity sold : Set of 4. Therefore all implied warranties that may apply to your part are limited to the duration of this written warranty. "Dorman Wheel Center Cap --. Series : Dorman OE Solutions. Under NO circumstances will our liability exceed the amount of the original sale. General Warranty Limitations (Applies to all Product Warranties). Lifetime Warranty. Free Shipping. Highest Quality. Replaces oe number : 15650047. "Dorman Wheel Center Cap --. Series : Dorman OE Solutions. Condition : New. General Warranty Limitations (Applies to all Product Warranties). Product fit : Direct Fit. The warranty is subject to the General Warranty Limitations below. Trending at $91.42eBay determines this price through a machine learned model of the product's sale prices within the last 90 days. Dorman's Wheel Nut Locks are engineered to last and easy to use. More Information for DORMAN 711626 DORMAN Warranty Information. 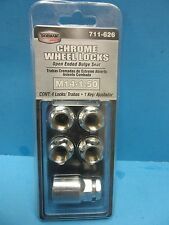 Wheel Lock Key Included Yes. Wheel Lock Type Female Spline. Thread Size M14-1.5. "Dorman Wheel Center Cap --. Series : Dorman OE Solutions. Condition : New. Therefore all implied warranties that may apply to your part are limited to the duration of this written warranty. Each warranty gives you specific rights, and you may have other rights which vary from state to state. Alternate/OEM Part Number(s): 15646250, 6116071, 711025, 99956, 999561. CADILLAC ESCALADE 1999. CHEVROLET AVALANCHE 1500 (2005 - 2006). CHEVROLET BLAZER (1992 - 1994). CHEVROLET C1500 PICKUP (1988 - 1999). 2002 Cadillac DeVille. 2003 Cadillac DeVille. 2004 Cadillac DeVille. 2005 Cadillac DeVille. Notes: Wheel Cap. Ensure Proper FitTo confirm that this part fits your vehicle, enter your vehicle's Year, Make, Model, Trim and Engine in the Compatibility Table. 2007 Cadillac Escalade. 2008 Cadillac Escalade. 2009 Cadillac Escalade. Ensure Proper FitTo confirm that this part fits your vehicle, enter your vehicle's Year, Make, Model, Trim and Engine in the Compatibility Table. Lowest Prices. Free Shipping/Returns. Perfect Fitment. 2007 Cadillac Escalade ESV. 2008 Cadillac Escalade ESV. 2009 Cadillac Escalade ESV. WARNING: This product may contain chemicals known to the State of California to cause cancer and birth defects or other reproductive harm. 2002 Cadillac DeVille. 2003 Cadillac DeVille. 2004 Cadillac DeVille. 2005 Cadillac DeVille. Notes: Wheel Cap. Fit Notes: 16 In. Easy to install.